The next irresistable serving of hilariously irreverent personal essays from the Indie Next Great Reads Pick author of IT'S NOT ME, IT'S YOU. Stefanie Wilder-Taylor is the author of Sippy Cups Are Not for Chardonnay and Naptime Is the New Happy Hour. She has written and produced more than thirty television sketch, clip, and variety shows, and been featured on Today, Oprah, Dr. Phil, Larry King Live, The Dr. Oz Show, and the award-winning PBS show Real Savvy Moms. She lives in Los Angeles with her husband and three young daughters. Visit her website at stefaniewildertaylor.com. So I still don't have her first book, but maybe soon! Hey there! I am your newest follower from Book Blogs and I love your blog design. That is so awesome that you have almost two thousand followers! I aspire to have a big blog like yours one day. I only started mine a month ago though, so I still need time to grow and expand. :) If you have time, you should stop by my blog and follow me too! What a great series you have on your blog! I'm a newbie, so please excuse me to be exuberance. I've heard about this book. I'm actually intrigued enough to want to pick it up (and I'm a sucker for the front cover). 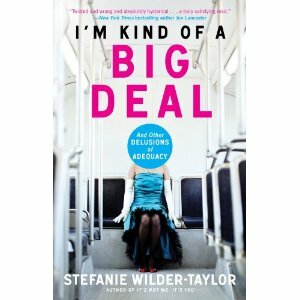 I love Stefanie Wilder Taylor and have read all of her books! Can't wait for this!